"Christmas decorations at the Vigan Heritage Village need not to be overdone. Vigan's Heritage Village is a discipline zone. It is a regulated place. If one will go here, one can notice that there are no dangling wires seen at the street and also, no motorized vehicles and only the calesas are allowed. The city wants to just maintain the architectural and cultural harmony of the place, thus regulations. For this Christmas, I think there must be a rule too. to the place as simple as it can be. Christmas decorations at the Vigan Heritage Village need not to be overdone. Everyone must be aware that what is too much can lead to imbalance. For the Heritage Village, the highlight is always the ancestral houses. Overdoing Christmas decorations could overshadow the optimum beauty of the city which can be seen in its simplest setting. As I went to this area on a high noon, I have this smile in my heart and somehow very glad that it is Christmas everywhere and I am seeing it at the heritage village. Many people prefer to have the grandest Christmas decorations given that they have the means but for this case, the simplicity of the decorations is itself enough to feel the touch of the Christmas spirit. The white Christmas decorations that are hanging at the old houses were just perfect to maintain the simplicity and the beauty of the place. Too much of them with different colors could be an eye sore to the place. I have tried imagining putting a lot of colorful decorations at this street and it doesn't really look good even at the pictures of my imagination. What is simple could be the best. I would always prefer the white decorations and adding more of it could already alter the beauty of the place which comes from the very simple concepts. 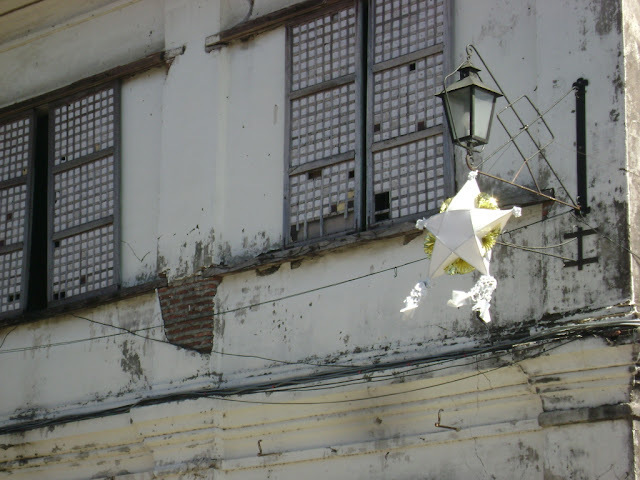 At the Vigan Heritage Village, simplicity is a virtue and the simple decorations can already speak a lot that the old street is enjoying the spirit of Christmas. Anyway, Merry Christmas everyone!